Sophomore Cameron Ferguson discusses how Bay Area collegiate orienteering is hindered by a lack of support and the difficulty of getting to the remote locations for tournaments. Photo by Prescott Watson. “Can you see the control from here?” asked UC Santa Cruz second-year Cameron Ferguson. Standing on a knoll overlooking the sun-blasted valleys and hills of Pacheco State Park, Ferguson wiped the sweat from his face and scanned the landscape. After a moment broiling under the sun, Ferguson — oblivious to the heat — pointed to a tree a kilometer from his position. Squinting, Ferguson noted the tree’s position on his topographic map. In a wilderness setting, participants use a topographic map and a compass to find “controls” — small markers that have an electronic register to record the time when a runner locates it. The controls can be placed several hundred meters to several miles apart. The goal is to find all of the markers in the correct order as fast as possible. Half cross country racing, half wilderness survival, orienteering combines all the physical rigors of endurance athletics with the mental acuity of a chess game. But despite an enthusiasm for racing and the wilderness, Americans have yet to make orienteering popular in the United States. Given the sport’s widespread popularity in Europe, enthusiasts wonder: What’s keeping orienteering off the map? 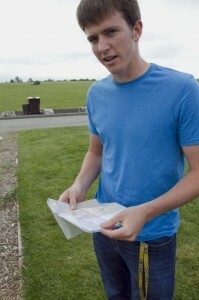 Jay Hann, an event coordinator for the Bay Area Orienteering Club (BAOC), said that it is sometimes difficult to explain the appeal of orienteering. The BAOC is one of 74 clubs in the United States that belong to the International Orienteering Federation. Each year, there are a multitude of international championships held for different types of orienteering, but the biggest ones are trail and skiing. In the United States, individuals compete in A-level meets to qualify for a spot on one of the U.S. championship teams. On Saturday, Hann was organizing the second day of a three-day meet in Pacheco State Park for the U.S. Intercollegiate and U.S. Interscholastic Championships, which the BAOC was hosting. Despite the swarms of participants streaming in from Seattle to West Point, Hann said this event’s numbers were nothing compared to those in Europe. Gavin Wyatt-Mair, another event coordinator for the BAOC, said that because of the sponsorship given to orienteering in Europe, Europeans tend to dominate the United States in international orienteering competitions. However, Wyatt-Mair is the father of a successful navigator. His son, Malcolm Wyatt-Mair, is a U.S. orienteering champion and UCSC graduate who competed in Australia and Sweden for the Junior Orienteering World Championships in 2007 and 2008. For Gavin — who has been orienteering for 24 years — orienteering has practical value off the course as well. For the few college students who do orienteering on the West Coast, the benefits of the sport are outweighed by the logistical troubles of reaching a meet. BAOC coordinator Hann said orienteering has the potential to catch on as a popular sport in the United States, but that would require teaching orienteering early on in schools. Taking a break from helping a few dozen latecomers register for their races, Wyatt-Mair described the philosophical benefits of orienteering.